AU is a file extension for audio files using an audio file format created by Sun Microsystems for the Unix platform for application on the Internet. AU is a file extension for audio files using an audio file format created by Sun Microsystems for the Unix platform for application on the Internet. AU is generally used to store encoded audio data and is helpful for saving large valuable storage space on users' hard drive. It offers toll quality sound and uses the .au extension typically. An audio file is comprised of three parts: a 24-byte header, an optional description field, and the actual audio data. Audio header and data fields are saved in network (big-endian) byte order, in spite of the native byte-order of the machine architecture on which an application might be running. For this reason, multi-byte audio data may need byte reversal, so as to control it by the arithmetic unit of certain processors. The header is 24 bytes, and the description field is not less than 4 bytes. So the data offset for most AU files is 28 bytes. The minimum valid number is 24 (decimal). But some users save additional data in the AU header. At the beginning, AU files only support a simple 8-bit u-law encoding at an 8000 Hz sample rate, but now AU files support a great number of audio encoding formats. If you want to convert AU files into MP3, you can convey your AU audio files into Text format to document your speech recording, dictations, interviews, research summaries, reviews, seminars, business meetings, and so on. AU file format does not support for smooth transcription process. With the purpose of reaching perfect transcription output, conversion of AU file format into MP3 is mandatory. 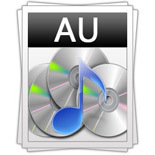 Audios, Speeches, Songs in AU file format can be conveniently mailed as an e-mail attachment.